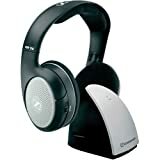 Amazon has the sennheiser RS110 Over-ear 926MHz wireless RF headphones for $59 with free shipping. Sells for $75+ Highest Price. Deals for $45 Lowest Price. Normally $59+.